It’s natural in the springtime to have concerns about pests that can impact health, from mosquitoes that can carry Zika virus and West Nile virus, to ticks that can transmit Lyme disease, and more. But what about pests that trigger allergy and asthma symptoms that commonly arise this time of year? Many are surprised to learn that cockroaches could be to blame for sneezing, itchy eyes and runny noses. Cockroaches are known to fuel allergy symptoms, especially in children, through the allergens found in their saliva and droppings. Cockroaches love warm, moist areas, so the spring is an ideal time for homeowners to take the time to cockroach-proof their homes and, in turn, help reduce potential household allergy triggers for themselves and their families. Keep the home – especially the kitchen and bathrooms – free of crumbs and debris. Disinfect counters and food surfaces. Do not let dirty dishes pile up in the sink – the food leftovers attract cockroaches looking to feed. Take out trash frequently, and store it in a sealed receptacle. Transfer open boxed food items from cardboard into sturdy, sealed containers. Keep pet food in a sealed container and wash pet bowls frequently. Vacuum at least once a week using a vacuum with a HEPA filter. Dust hard surfaces frequently with a dust rag or damp cloth. Maintain the humidity level in the house at about 50 percent by properly ventilating basements and crawl spaces. Consider running a dehumidifier in these areas to prevent moisture buildup. Be sure to keep homes as clean as possible since cockroaches love filthy environments, but if they do find their way into your home, contact us HERE. We can help! SPRING AND SUMMER TEMPS WILL BRING OUT THOSE PESKY INSECT NEIGHBORS OF YOURS. They want to visit! Pest proof your home! Now is the perfect time for you to be proactive and complete simple home improvements to pest proof your home. 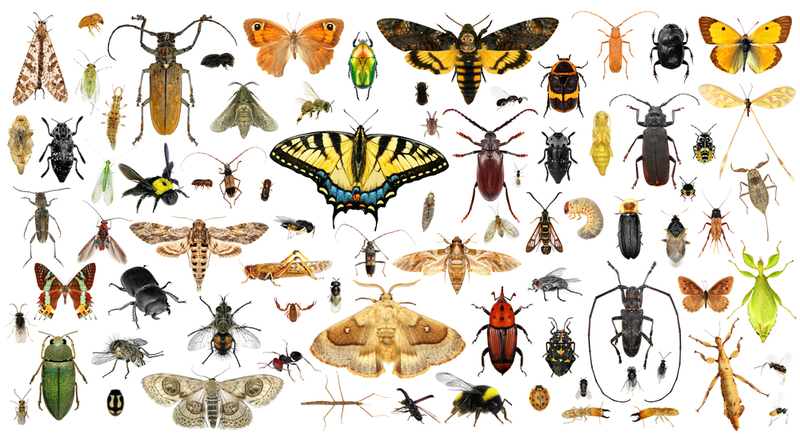 Spring is when we begin to notice an increase in pests, such as ants, termites, mosquitoes and other stinging insects. Expect to see more bugs, lots of them! It’s best to get ahead of what’s coming! Eliminate sources of standing water around the house, including birdbaths and in clogged gutters to help reduce biting mosquito populations. Seal any cracks on the outside of the home with a silicone-based caulk, including entry points for utilities and pipes. Keep tree branches and shrubbery well trimmed and away from the house. Overhanging branches can act as critter highways into the home. Repair fascia and rotted roof shingles. Keep mulch at least 15 inches from the foundation. Avoid leaving pet food out in dishes for long periods of time. As you dig through your pantry in search of ingredients to bake pumpkin pie, cookies and other goodies for the holidays, you should keep your eyes peeled for pests that could be hiding in the bag of flour, chocolate or spices. These pantry pests gather around food products stored in pantries and cabinets. Be wary: They can take over your pantry! It’s not uncommon for homeowners to encounter merchant-grain beetles, Indian meal moths, flour beetles and other pantry pests this time of year with holiday baking is in full swing. These pantry pests are often brought into the home unknowingly in items stored in paper packaging and unsealed bags. Inspect all items for signs of damage before bringing them indoors! Seal items: Proper food storage can go a long way in preventing an infestation. Once packages are opened, move ingredients into sealed glass or Tupperware-type containers with secure lids before storing them in the pantry or cabinet. Check dates: Remember to check expiration dates on ingredients before use. Periodically sort through old items in the pantry and toss out anything that has been stored for a long time. Clean often: Immediately wipe up any crumbs or spills from countertops, tables, floors and shelves. Occasionally empty the cupboards and clean them with soap and water to get rid of residue and anything that may be hiding inside. 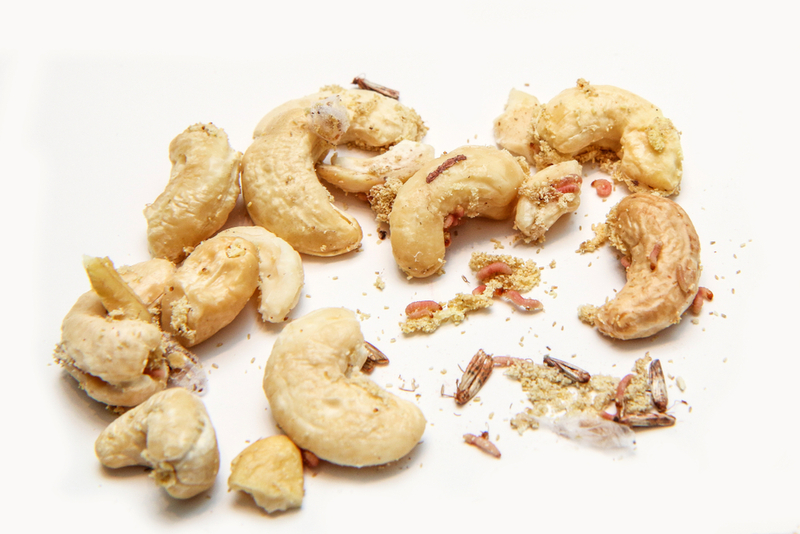 If you spot pantry pests in your food, immediately dispose of them in a sealed trashcan. Contact ClearDefense HERE for assistance in eliminating a full-blown infestation. We want to help! WINTER INVADERS. When mornings and nights turn cooler, it’s likely you’ll see more and more critters of all shapes and sizes heading for warmer temperatures—like inside your home. Stink bugs, kudzu bugs, lady beetles, boxelder bugs and many, many other winter invaders will try to get into your home to avoid colder weather. You’ll find these hungry little guys mostly in corners, or by windows and doors—near wherever they manage to enter your home. The best way to keep winter invaders out is to get your home and property treated before it’s too late. You may be out of luck once you start to notice the insects inside. Once they’re in, they’re in, there’s not much a homeowner can do without professional, pest-control help. Often during seasonal changes like spring and fall, many people tend to leave windows and doors open. This gives those nasty winter invaders easy access to your home and hearth. Experts say that the best thing is to maintain your preventative treatments when it starts to get cool outdoors. If you already have a service, keep it up. Your goal should be to keep those winter invaders out during seasonal transitions and to focus on exclusion by sealing cracks and crevices where these insects and pests will otherwise sneak in. As temperatures drop, food and shelter sources also become less available for pests like spiders and ants, too—so it also becomes harder for them to survive outdoors. You can be sure that they will be working overtime to move into your home and start feeding on food sources there. Not a pleasant thought. We recommend maintaining a perimeter treatment around your property to create a barrier to kill pests as they try to enter your home. Getting a treatment like this doesn’t mean you will never see an ant or spider again, but it can greatly reduce their numbers and make it much harder for them to take hold and start nesting in your home. Contact us HERE! We can help. SINISTER SUMMER STINGERS. They may not have been invited, but those sinister summer stingers are inevitable guests to summers most anticipated gatherings. These summer fun-stealers send more than 500,000 people to the emergency room each year and are especially active during the second half of summer when the colonies forage for food that will sustain their queens during the winter. It is during this time that most people fall victim to the physical and financial sting that these summer stingers pose. 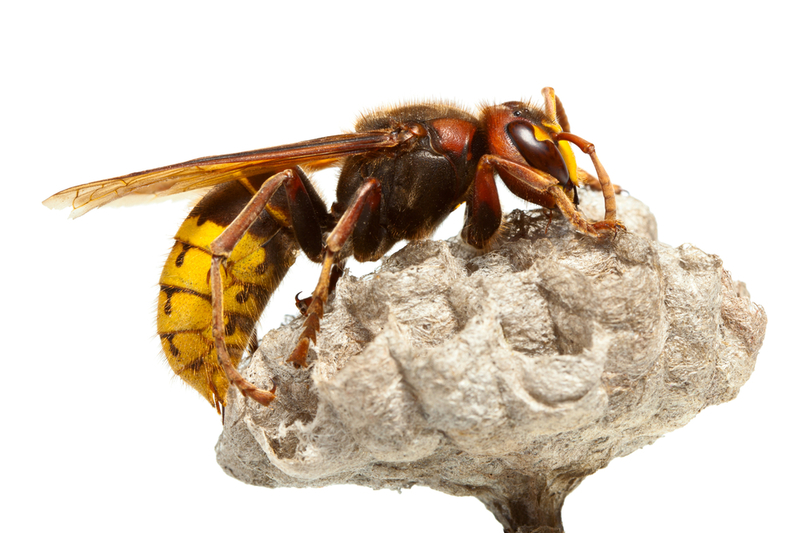 Two varieties of sinister summer stingers, the hornet and the carpenter bee, pose significant threats to ones health and home. Hornets live in large colonies and their nests are shaped like an inverted teardrop. While their venom is no more dangerous than other stinging insects, they are much more aggressive when disturbed and tend to sting repeatedly. This behavior adds to the potential for greater skin irritation or a serious allergic reaction. Carpenter bees build their nests by drilling perfectly round tunnels into soft woods. Coarse, natural colored sawdust will often be present near the entrance to the nest. Over time, these tunnels can severely compromise the support structure of a building. Wear shoes, especially in grassy areas. Do not swing/swat at stinging insects. Seek immediate medical attention if stung—reactions can be severe. Due to the aggressive nature of those pesky and sinister summer stingers, homeowners should not attempt to remedy an infestation on their own. Contact us HERE. We can help! 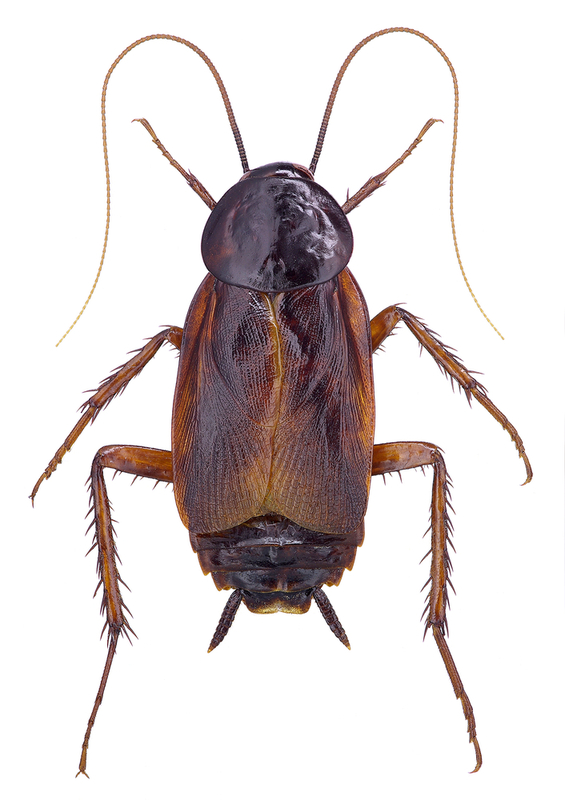 THE ORIENTAL COCKROACH is believed to be of North African origin, despite its name. Oriental cockroaches are sometimes called “waterbugs” because they come out of drains, and “black beetle cockroaches” because of their smooth, dark bodies. They are known for their strong, unpleasant, “roachy” odor. The Oriental cockroach feeds on all kinds of food, especially decaying organic matter and starchy foods. This species of cockroach can survive outdoors in freezing temperatures for long periods of time. Outside, these cockroaches are often found in sewers and under debris, leaves, stones and firewood. They will enter structures through door thresholds, under sliding glass doors, along utility pipes and through floor drains. Once indoors, Oriental cockroaches find harborage in basements and crawl spaces. Oriental cockroaches have been reported to spread at least 33 kinds of bacteria, six kinds of parasitic worms and at least seven other kinds of human pathogens. Their habit of feeding on filth means that they are likely to pick up germs on the spines of their legs and bodies as they crawl through decaying matter or sewage and then carry these into food or onto food surfaces. The best advice for their control is to practice good sanitation. To prevent Oriental cockroaches from infesting your space, vacuum often, keep a spotless kitchen, seal all entrances around utility pipes and ventilate crawl spaces to prevent moisture buildup. 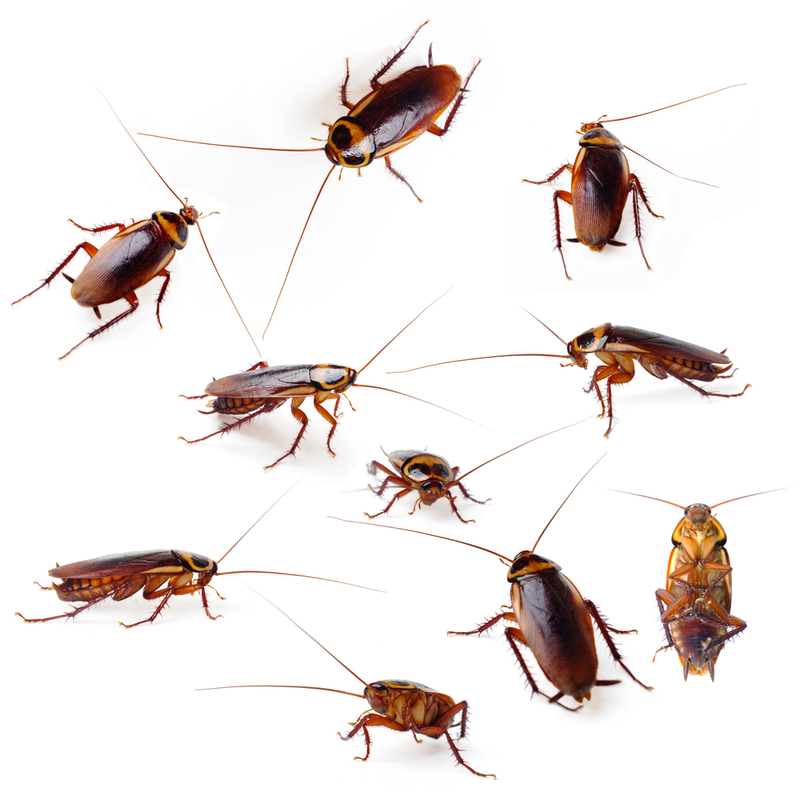 If you see evidence of a cockroach infestation, contact us HERE at ClearDefense Pest Control. We can help! Spreading serious diseases, including salmonellosis (food poisoning), leptospirosis, rickettsialpox and lymphocytic choriomeningitis (LCM). Lyme disease and bubonic plague. Gnawing, causing expensive structural damage. They also can start fires if they gnaw on electrical wires. The Norway rat (synonymous with brown, dump, barn, sewer, gray or wharf rat) is a burrowing rodent. Norway rats can be found in warehouses, farm buildings, houses, sewers, rubbish dumps, woodpiles and building foundations. The roof rat (black or ship rat) is somewhat smaller and is a more agile climber. An actual rodent, dead or alive, is a telltale sign of a potential rat problem. The presence of droppings around the home. Fresh roof rat droppings are soft and moist, whereas old droppings are hard and dried. The droppings usually measure about ½” (12-13 mm) and have pointed ends. Droppings from Norway rats are larger – measuring about ¾” (18-20 mm) with blunt ends. Gnaw marks, damaged goods, nests or greasy rub marks also indicates roof rat activity. Noises in the attic or house walls and damaged electrical wires. Seal up any holes or cracks larger than a quarter with silicone caulk . Be sure that all windows and vents are screened. Keep trees and shrubs trimmed away from the building and cut back limbs overhanging the roof. Clean up fruit that may fall from trees in the yard and keep garbage in tightly covered receptacles. Store pet food and other dry food in sealed containers. Eliminate any outdoor sources of water such as leaky sprinkler heads, pet water dishes and birdbaths. If you suspect a roof rat infestation in your home, contact us HERE at ClearDefense Pest Control. We can help! 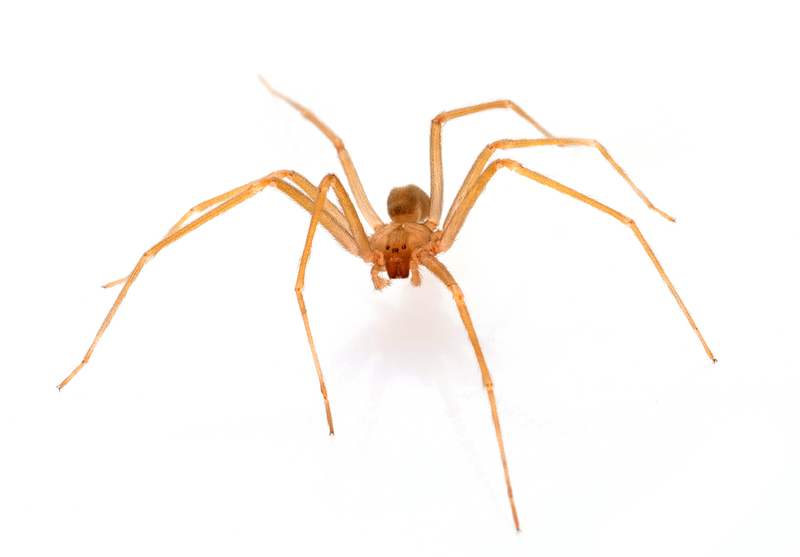 THE BROWN RECLUSE SPIDER is known for its “reclusive” behaviors, because it prefers to take residence in warm, dry and dark environments, such as woodpiles, basements and closets. This arachnid bites—usually unintentionally—when it feels trapped, typically when a hand or foot reaches into a shoe or piece of clothing or in a box in the attic or basement where a brown recluse has made its home. The female spins an irregular web in undisturbed areas, like the garage, attic and basement. The web is not used to catch prey, but rather as a retreat. Outside, brown recluse spiders are typically found around rocks, piles of inner tubes, utility boxes, woodpiles, block-wall voids, under bark, etc. Inside the home, brown recluse spiders can be found in almost any undisturbed area. They are most commonly found in boxes, among papers, and in seldom-used clothing and shoes, although they can be found in corners, underneath tables and chairs, or in crevices such as those found along baseboards, doors, and window moldings. Storage areas such as closets, bedrooms, attics, crawl spaces, and basements are preferred nesting areas. Both male and female brown recluse spiders can bite and inject venom. Injection of their venom may produce necrosis or dead tissue, resulting in an ulcerating sore. Healing is very slow and usually takes several weeks, resulting in dense scar tissue. In severe cases, plastic surgery may be required. The bite of a brown recluse spider is usually not felt, but it may produce an immediate stinging sensation followed by intense pain or this reaction may be delayed for 6–8 hours. A small blister usually appears and the surrounding bite area becomes swollen. Symptoms include restlessness, fever and difficulty sleeping. The dead tissue gradually sloughs away during the next 10–14 days, leaving an open ulcer and possibly exposing the underlying muscles and/or bone. Call a physician or go to an emergency room immediately if bitten, and take the spider along for identification purposes. Inspect the outside of the home for any small openings or holes, paying special attention to areas where utility pipes enter the structure. Seal any such openings with a silicone caulk to prevent spiders and other insects from gaining access inside. Stack firewood at least twenty feet from your home and five inches up off of the ground to deter spiders from hiding out in the woodpile. It’s a good idea to wear gloves when moving the wood, and inspect it carefully before bringing indoors. Clothes and shoes should not be left on the floor, or they must be shaken out before wearing, especially if stored in the basement, garage, or other dark area. Store seldom-used items, such as boots, baseball mitts, skates, gardening clothes, and gloves, in tightly sealed plastic bags or boxes. Control of brown recluse spider infestations should be left to a licensed pest-control professional. 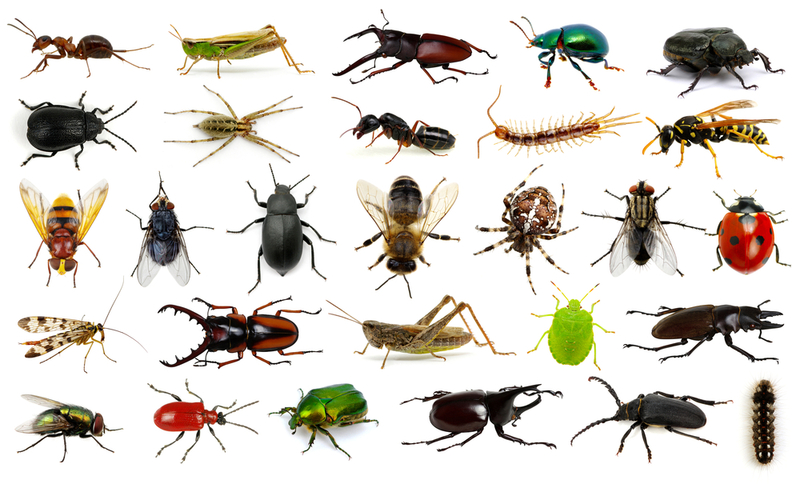 If you suspect a problem, please contact us HERE at ClearDefense Pest Control. We can help! Millipedes are sometimes called “thousand-leggers” because of their many pairs of legs, but they actually have anywhere from 30–90+ pairs of legs, depending on the species. The leggiest is Illacme plenipes, which can have more than 333 pairs of legs. Most millipedes are nocturnal and are primarily scavengers, feeding on decaying plants and occasionally dead insects. In the autumn, millipedes are known to migrate in great numbers. Millipedes are found throughout the world, with about 1,000 species occurring in the United States alone. They are typically found in areas of high moisture and decaying vegetation, such as under trash, in piles of grass clippings, flowerbed mulches, piles of leaves, etc. 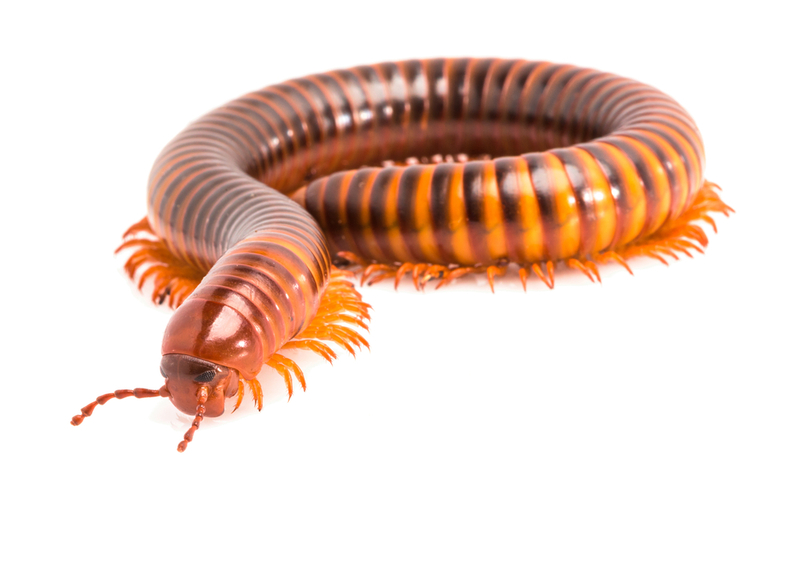 Millipedes do not usually survive indoors for more than a few days unless there are high-moisture conditions and a food supply is present. Some millipede species give off an ill-smelling fluid through openings along the sides of the body. Underscoring the importance of millipede control, this fluid can be toxic to small animals and pets, and can cause small blisters on humans. Reduce areas of moisture in and around your home. Run a dehumidifier if you have a damp basement. Keep lawns mowed so that grass does not retain moisture. Water lawns in the early morning to allow grass to dry during the day. Remove leaf piles and grass clippings. Store firewood off of the ground. If you have any questions or concerns, contact us HERE at ClearDefense Pest Control. We know what to do! Mice are the most common rodent pest in most parts of the world. They can breed rapidly and adapt quickly to changing conditions. In fact, a female house mouse can give birth to a half dozen babies every three weeks, and can produce up to 35 young per year. House mice prefer to eat seeds and insects, but will eat many kinds of food. They are excellent climbers and can jump up to a foot high. They are colorblind and cannot see clearly beyond six inches. House mice live in structures, but they can survive outdoors, too. They prefer to nest in dark, secluded areas and often build nests out of paper products, cotton, packing materials, wall insulation and fabrics. 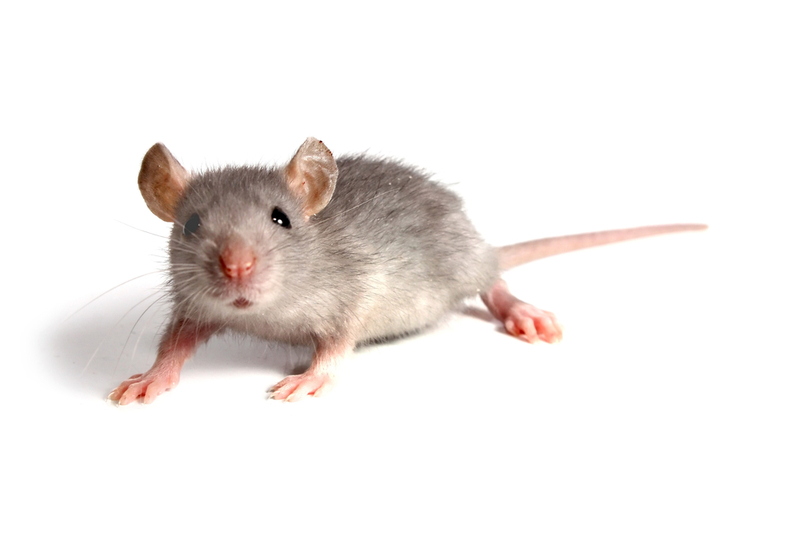 Mice can also bring fleas, mites, ticks and lice into your home. Rodent infestations in the home can have a profound effect on health. Rodent feces can spread bacteria and trigger allergic reactions. Micro droplets of mouse urine can cause allergies in children. 1. Make sure all holes of larger diameter than a pencil are sealed. 2. Keep areas clear and store boxes off of the floor because mice can hide in clutter. 3. Don’t overlook proper drainage at the foundation and always install gutters or diverts which will channel water away from the building to prevent ideal conditions in which house mice can nest. 4. Regularly inspect the home for signs of mice including droppings, gnaw marks and damaged food goods. 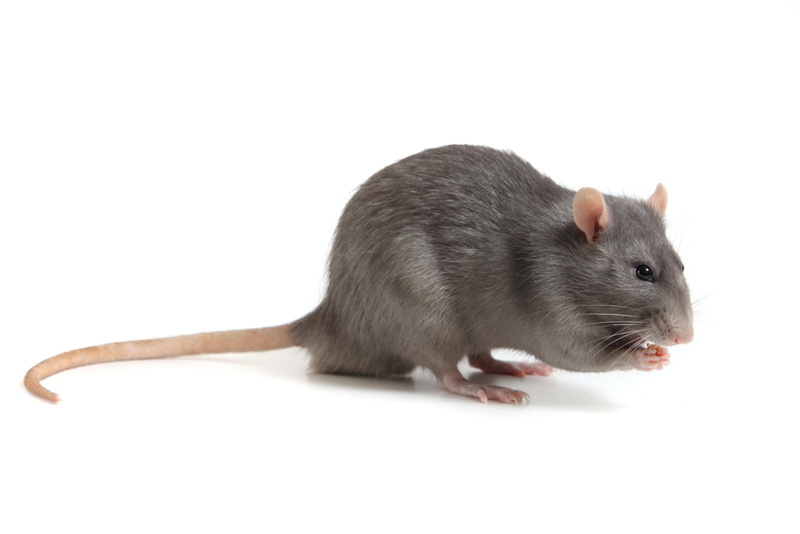 If you suspect a rodent infestation, contact us HERE at ClearDefense Pest Control. We can help. Get a FREE QUOTE and Schedule Service in Durham! A technician will be in contact with you shortly.